Basketball superstar LeBron James will be back in Manila on August 20 to mentor the Rise players and to announce members of the final Rise team. This event is made possible by Nike. LeBron James started his basketball career in high school. He spent countless hours in the gym to practicing and honing his skills. His passion for the game and drive for excellence eventually paved the way to basketball superstardom. LeBron became a professional basketball player in 2003. His earlier achievements included two championship rings, four MVP Awards, two Finals MVP Awards, and two All-Star MVP Awards. He was also the centerpiece of two Olympic Gold Medal runs in 2008 and 2012. Last year, he led his team to the finals despite many challenges, showing everyone how doing their best and not giving up could help them rise above adversities. LeBron’s visit in Manila will inspire young Filipino athletes and aspiring basketball players to overcome the challenges to achieve their dream. Catch LeBron James live on August 20 at the Mall of Asia Arena and hear how he motivates all to “Rise Beyond Belief”.Gates open at 6:00PM.You can get tickets by registering on #LeBronJamesRiseTour starting 9:00AM until 11:59PM today, August 14. Fans who successfully register should bring their confirmation email and valid ID on the designated times and dates at Nike stores from August 15 to 18 to pick up their tickets. Fans can likewise enjoy a custom “Rise Beyond Belief” photo booth exclusively at Nike Park Fort in Taguig and be part of a special LeBron James photo mosaic. Episodes 1 to 5 of Nike Rise will air all Sundays of August at 6:00PM on TV5. To learn more about #RISE and LeBron James’ visit, follow Nike Philippines on Facebook (https://www.facebook.com/nikebasketball) and Twitter via @NikePH. 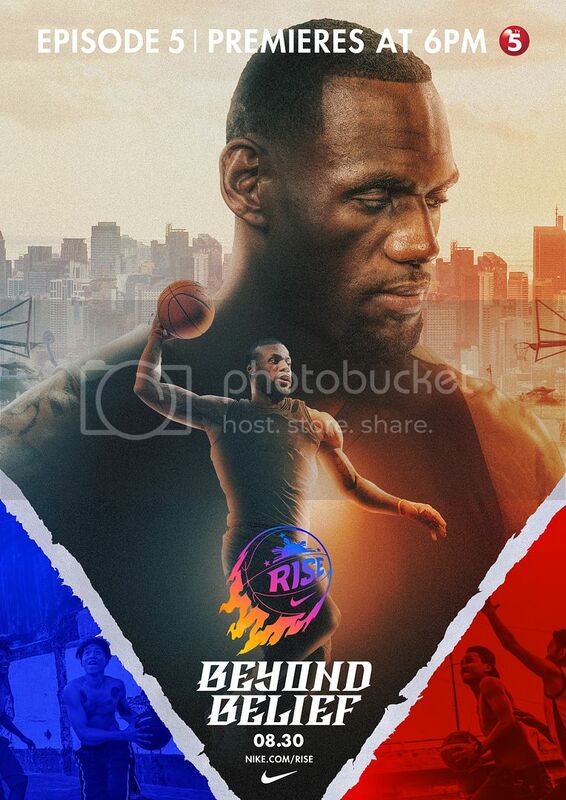 This entry was posted in #RISE, Basketball, LeBron James, Mall of Asia Arena, Nike, Nike Rise, Press Release, Rise Beyond Relief, Rise Team, Rise Tour. Bookmark the permalink. ← Experience Great Winning Moments. Join Great Taste White’s Choose Great, Win Great Promo!